I attended Moose Lake Agate Days, located around an hour south of Duluth, for the fifth year in a row, second with a booth. Since the event was mentioned on the Travel Channel’s Cash and Treasures show, the number of people in attendance was almost out of control. On Saturday, there were definitely too many people in the gym. 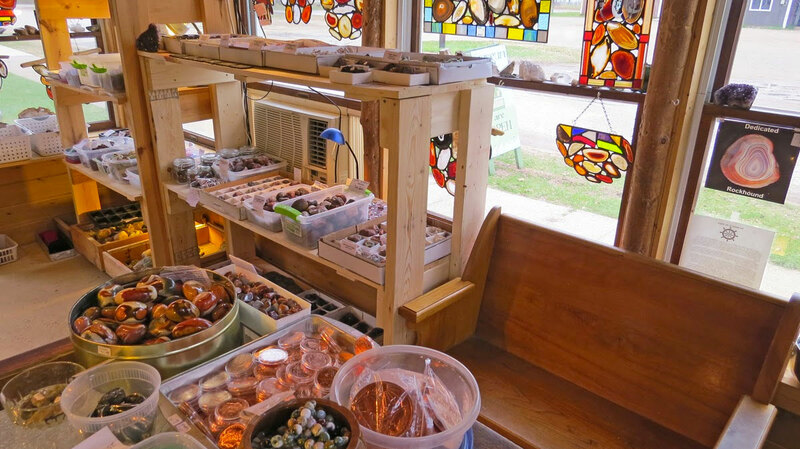 However, sales were great and the agates this year were even better than last year. I was able to spend a little bit of time agate hunting. However, the owner of my favorite gravel pit is leasing out the pit to an asphalt company. There are so many trucks coming and going, that it is not safe. As a result, Doug has asked people to stay away until the contract is over in two years or so. Thus, my friends and I tried our luck at farm field hunting again. We returned to the Aitkin, MN area and went with permission to the field in which I found the semi-fister in May. I didn’t find any big ones this time, but my friend, Jill, did. Below are some of the photos I took to document the big agates that were either available for sale, or at least displayed. The first two show some of the booths inside and outside. The other photos show some of my favorite agates that I saw and was able to document.